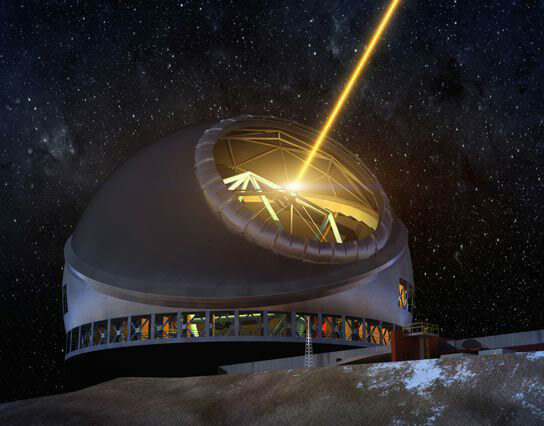 The recent approval of a sublease brings the most advanced and powerful optical telescope, the Thirty Meter Telescope (TMT), one step closer to reality. With the recent approval of a sublease by Hawaii’s Board of Land and Natural Resources, initial construction on the Thirty Meter Telescope — destined to be the most advanced and powerful optical telescope in the world — can now begin later this year. The board’s final go-ahead, received July 25, moves the University of California and UCLA a step closer to peering deeper into the cosmos than ever before. Work on the Thirty Meter Telescope (TMT), named for its 30-meter primary mirror — three times the diameter of the largest existing telescopes — will take place atop Hawaii’s dormant Mauna Kea volcano. The TMT’s scientific operations are slated to start in 2022. Researchers in the UCLA College will play a significant role in the development and use of the TMT, which will enable astronomers to study stars and other objects throughout our solar system, the Milky Way and neighboring galaxies, and galaxies forming at the very edge of the observable universe, near the beginning of time. The project is a collaboration among universities in the United States and institutions in Canada, China, India and Japan, with major funding provided by the Gordon and Betty Moore Foundation. “UCLA is taking a lead role in defining the science for this monumental, international project,” said Andrea Ghez, a professor of physics and astronomy who holds UCLA’s Lauren B. Leichtman and Arthur E. Levine Chair in Astrophysics. Ghez, who has served on the TMT science advisory committee since its first meeting 13 years ago, described the master agreement as an important milestone for the UC system, UCLA and the field of astronomy. UCLA professor of astronomy James Larkin is one of those excited about the TMT’s potential. He is the principal investigator for the Infrared Imaging Spectrograph (IRIS), one of three scientific instruments that will be ready for use with the TMT when the telescope begins operation. The instrument will be able to produce images three times sharper than what is currently achievable with the two powerful W.M. Keck telescopes on Mauna Kea and many times sharper than the Hubble Space Telescope, Larkin said. IRIS will image planets that are forming but are often too dim and red to be detected by smaller telescopes, and it will be the only one of the three TMT instruments to magnify images to the theoretical diffraction limit. With the most sensitive spectroscopy available anywhere in the near-infrared, IRIS will yield the first real understanding the physical nature of these early galaxies, a key goal of research in cosmology and astrophysics. IRIS is a joint project involving more than 50 astronomers from the U.S., Canada, Japan and China, and many of the instrument’s most crucial components will be designed and built at UCLA’s Infrared Laboratory for Astrophysics, founded more than 20 years ago by Ian S. McLean, who is the lab’s director and a UCLA professor of physics and astronomy. The TMT, McLean said, will enable astronomers to see not only much fainter objects but also to resolve them in much greater detail. In 1989, at the beginning of the era of the twin W.M. Keck telescopes — currently the world’s largest optical and infrared telescopes — UCLA set up its infrared astrophysics lab to develop state-of-the-science instruments for them. All four of the currently operational infrared cameras and spectrometers on the Keck telescopes were built entirely or in part at UCLA. McLean expects UCLA’s infrared lab to play a similar role with the TMT. The concept of a telescope three times larger and with nine times more light-gathering power than the Keck telescopes was first envisaged nearly 15 years ago, and UCLA has played a major role in defining the type of instruments needed for such a telescope. IRIS, under Larkin’s leadership, is one example, McLean said. Another proposed TMT instrument, the Infrared Multi-Slit Spectrometer (IRMS), will be a near-replica of the successful MOSFIRE instrument that McLean delivered to the W.M. Keck Observatory in 2012. With the sharpest and most sensitive images ever taken in the near infrared, the TMT and IRIS will reveal the universe in new ways, exploring everything from dwarf planets at the orbit of Pluto to the most distant galaxies ever explored near the dawn of time, McLean said. UCLA’s Ghez, who leads the development of the Galactic Center project, said her research will be greatly enhanced by the Thirty Meter Telescope. Ghez and her colleagues discovered a supermassive black hole at the center of the Milky Way that has a mass approximately 4 million times that of our sun. Such mysterious and intriguing black holes, which were predicted by Einstein’s theory of general relativity, provide remarkable laboratories for the study of physics in extreme environments. The TMT, Ghez said, will identify and map the orbits of fainter stars close to our black hole, extending our knowledge of physics with a fundamental test of Einstein’s theory. Because stars in the vicinity of the black hole will be affected by the presence or absence of dark matter, their orbits will significantly constrain our current model of dark matter, which is central to our understanding of galaxy formation. TMT will also extend our ability to measure accurate masses of black holes in more distant galaxies and in low-mass galaxies, likely revealing when and how black holes are “fed,” Ghez said. By revealing details about resolved stellar populations in nearby galaxies, the TMT and IRIS will directly probe the formation of nearby stellar systems like our own Milky Way. Because it will be possible to measure the mass distributions of stars in a variety of new environments and in galaxies outside of the Milky Way, IRIS will help scientists learn whether stars form differently under different conditions. In the distant universe, IRIS’s ability to image and study the internal workings of early galaxies will represent a major breakthrough in the study of galaxy formation during the known peak period of star formation. The Thirty Meter Telescope is a collaboration of the University of California, the California Institute of Technology, the Association of Canadian Universities for Research in Astronomy, the National Astronomical Observatory of Japan, a consortium of Chinese institutions led by the National Astronomical Observatories of the Chinese Academy of Sciences, and institutions in India supported by India’s Department of Science and Technology. In addition to President Yudof, signatories of the TMT master agreement are Donald E. Brooks, chair of the institutional council of Association of Canadian Universities for Research in Astronomy; Jean-Lou Chameau, president of the California Institute of Technology; Masahiko Hayashi, director general of the National Astronomical Observatory of Japan; P. Sreekumar, director of the Indian Institute of Astrophysics; and Jun Yan, director general of the National Astronomical Observatories of China. Intel co-founder Gordon Moore and his wife, Betty, established the Gordon and Betty Moore Foundation to support bold ideas that create enduring impact in science, environmental conservation and patient care. Be the first to comment on "Construction to Begin on the Thirty Meter Telescope"